I do not know of any measurements with a colorimeter above 130 nits for the SXGA+. I had two new XGA HV121X03-100 which were close to 150 nits. Manufacturers were not always truthfull about the screen brightness. Last night I pulled the glass off a bubbled -101 to finally check--- same polarizer as used on the -100, and it has a beveled edge. Checked two of the screens where I removed the glass, and they both have that type of corner. True, but I think it's more that they use the measurement method that gives the best-looking results more than they completely make up the numbers. I tried a quick experiment and narrow FOV does give higher apparent brightness numbers. bwaldow wrote: Am I better selecting one of the existing solutions, or do you have devices you can provide? I have several of the original prototype run I can send to people, and I'd rather give away the prototypes for now so that there's more testing before I actually sell anything. The prototypes have been reworked a few times in testing (so the soldering isn't as beautiful as a factory-made board) but they're all in perfect working condition. SO, if you're OK with being a guinea-pig, I can send you a board for free immediately. PM me. I may not have understood. I received the parcel today, and there is a tiny PCB in it. What source do you suggest for me to buy the LED strip, and which one do you recommend for your board? What components aside from an LED strip and your board must I acquire? I have modest soldering skills, and limited equipment - any recommendations in light of that? bwaldow wrote: I may not have understood. I received the parcel today, and there is a tiny PCB in it. Yes, I just sent an LED driver. Oops. OTOH, post to Australia was actually pretty cheap. I can send other parts as needed. Any 9.6V 'buck-down' strip is compatible; these are the strips where LEDs are grouped in series in threes. I didn't have any good suggestions for LED strip sources because it depends on the exact screen, and all the commercial outfits selling these things are inconsistent about what LEDs they send. I have made some strips myself that I have spectrometer-matched to specific screen models. I also unexpectedly got a shipment of LED strips from iCCFL last week that are great matches to the AFFS screens. They're definitely the same LED type/manufacturer iCCFL usually uses, but these are a different bin than they'd sent me before and give a nice 6600K whitepoint right on the daylight locus. Reds are a bit more muted than on my strips, but they're also a good 30% brighter. [*]What components aside from an LED strip and your board must I acquire? Aside from the driver board, you need a strip. You'll need to mod the inverter in your machine to mount the driver board (or you can pick up spares on ebay for $5-10), and then you'll need to mod your screen to install the strip once you've verified the LEDs are working properly. You can install the driver board onto an existing inverter with nothing more than a normal low-wattage pencil iron. Hot air would make getting the existing driver chip off the inverter easier, but it can be done without. Otherwise, it's just connecting up wires from points on the inverter to the solder pads on the edges of the driver. I've recently acquired a X61 and a HV121P01-100 to put in it, and I'm very interested in swapping out the CFL tube for some LEDs. Do you have any prototype driver boards left? I'm more than happy to cover shipping / any other expenses and help you test them out (I don't own any color calibration kit, but I can help on the electronics side of things)! Hello everyone! Sorry to disappear for a while unexpectedly. I got very very behind on life for a period. (Aside from travel for work and family, I also moved cross-country twice in five months. Like, full-on pull up the roots and relocate move). Yes, I have a decent number of prototype LED driver boards left. Even better, it appears iCCFL is currently shipping LED strips well suited to AFFS screens. They have slightly less saturation than the custom strips I made by hand, but they're also slightly brighter. The whitepoint and overall color balance are good. And I ordered 30 of them to keep a backup stock on hand. *That said*... I had one of my beta testers literally burn down a motherboard on an X61s. He'd made other mods too and was using a custom LCD cable to support an SXGA screen (and had issues with the lid switch getting hot... ?!?!?!? Apparenty a common bug in modded SXGA cables? A bit scary). I don't *think* it was the LED driver--- but I'm worried it *could* have been. No one else has reported anything more serious than wanting a different brightness step scale, but I'd like to think a bit more about the mystery of that poor X61s before sending out more boards. Anyone else familiar with custom SXGA screen mods and what might have gone wrong there? The adapter cables sold for the SXGA+ mod very often have extremely bad soldering. From what I have seen, those with the white cables all have to be redone if you want a screen mod you can depend on. And I have not had any problems with the lid switch. Your driver is still working fine in my X61. xiphmont wrote: it appears iCCFL is currently shipping LED strips well suited to AFFS screens. They have slightly less saturation than the custom strips I made by hand, but they're also slightly brighter. The whitepoint and overall color balance are good. And I ordered 30 of them to keep a backup stock on hand. I have an iccfl kit kit installed few years ago. It works fine, the only problem is the yellowish backlight. Could you please refer to the right strip (that you have ordered) in their catalog that would have whiter backlight with their original driver? The strips xiphmont is referrring to will not work with your driver. The 255 mm strips have groups of 3 LEDs. The drop-in kits for X61 come with strips that have groups of 8 LEDs. wileE wrote: The adapter cables sold for the SXGA+ mod very often have extremely bad soldering. I just managed to re-make contact with him (he also moved recently) and he's sending me the board along with the inverter he mounted it on. The problem he had was immediate, not an unexpected failure that happened after some time, so hopefully it will be easy to figure out once I have the board back. I just can't fathom how either a cable soldering error *or* a defect in the LED driver could possibly affect, eg, the lid switch... but I intend to figure it out. Also, he'd been using the same cable with a regular CCFL inverter for some time and it worked properly, and he's since gone back to a regular inverter with the same cable-- that also still works. That says to me the LED driver is the likely fault; either an assembly error (be it mine of his) or a design/component defect. I suppose I'll find out soon. How did he even notice that the lid switch was hot? Did it start smoking? That part is usually inaccessible. wileE wrote: How did he even notice that the lid switch was hot? Did it start smoking? "it melted the plastic around it". But I think this all went went wrong immediately during testing and before he reassembled the machine. I have ~ 30 LED driver kits made up and mounted to inverters for X60 and X61 (regular, s and tablet) models at this point. The iCCFL strips I ordered all turn out to be decent for AFFS. Hooray! The LED pattern being visible along the bottom of the SXGA screens has continued to bug at me though. The problem is the construction of the waveguide. Boe/Hydis builds the horizontal dispersion prism into the waveguide of the SXGA screen instead of using a separate film layer like on the XGA screens (the dispersion design is different overall, but this is the difference that causes the patterning). I imagine that's also what causes the visible LED pattern in the other high res screens like the QXGA. This design gets about 15% higher brightness over the XGA design, a good thing since the SXGA screens are naturally about that much dimmer. Swapping in the XGA waveguide and prism films eliminates the patterning problem, but it hurts brightness and involves deep screen surgery. So I've decided to experiment with leaving the SXGA screens in-tact and blue-pumping a remote phosphor strip. Remote phosphor also means I can tweak the spectral response to almost anything I want. Oh, and it can potentially double brightness yet again. Downside: remote phosphor + mid-power blue pump is be expensive. Like, about $30 for just the LED strip expensive. OTOH, it has the potential to quadruple brightness while also improving color over the original CCFL. Right now the LED backlights can almost double brightness, but color saturation suffers (especially red/green separation). Oh, and in other news I noticed it's *really* easy to swap the "glass"/multitouch surfaces between LCD frames. The mounting adhesive pops right apart when you tweak it just so with a hobby knife. That also leaves it in perfect condition for remounting. Remote phosphor, you say? Interesting. So does that mean you have a supplier for custom phosphors to get the right color match? I've gotten used to the pattern, it's hardly visible under normal usage if you're using a transparent task bar and a nonuniform desktop image, but I do get reminded that it's there watching movies, booting and reading documents in full-screen. A fix and more brightness would be great. I tested the new strip in bright sunlight the other day, and while it's miles better than the old CCFL, working outdoors still isn't optimal. flyingfishfinger wrote: Remote phosphor, you say? Interesting. Yup. PhosphorTech has some samples on the way. Let's see how it goes. What is remote phosphor? Especially the "remote"? Something to coat the light emitting part of the LED with? And I tried that stuff with swapping the waveguide and different diffusor sheets from other screens to the SXGA+, but never came up with a combination that was worth the effort of taking apart the screen. Did you solve that mystery with the burnt mainboard? wileE wrote: What is remote phosphor? Especially the "remote"? 'remote' == The phosphor for making the white light is external to the LED. It's a sheet or strip of material the blue LED shines onto. What makes it attractive is that it's more efficient (phosphor doesn't get hot, doesn't need to be as compact, the blue die can be higher power) and it's available as a combination of separate red and green phosphors instead of a single broad yellow phosphor. 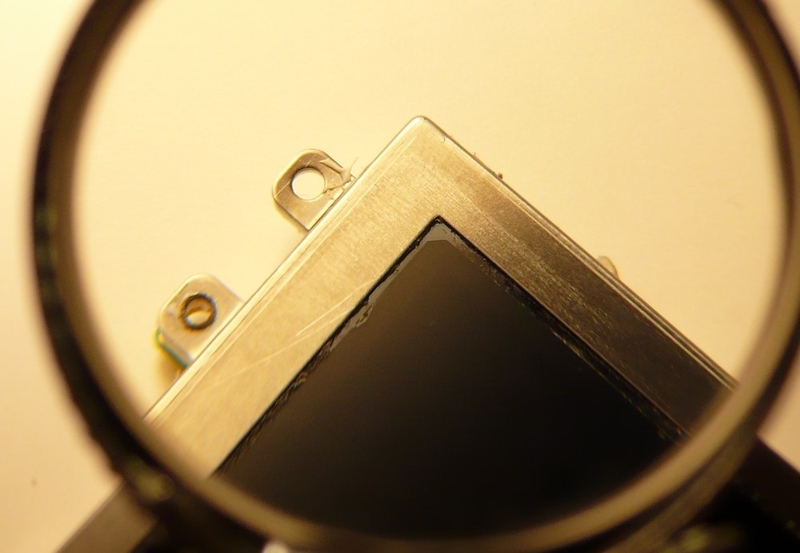 Digging around on google it appears this is how most LCD backlights are being made now. No, the dude hasn't returned the part yet. I'm still expecting 'assembly error', but I'd really like to know for sure. Since getting back I've done extra testing of the LED drivers with X60s and X61s... no hint of misbehavior. xiphmont wrote: The iCCFL strips I ordered all turn out to be decent for AFFS. Hooray! The LED pattern being visible along the bottom of the SXGA screens has continued to bug at me though. The problem is the construction of the waveguide. Boe/Hydis builds the horizontal dispersion prism into the waveguide of the SXGA screen instead of using a separate film layer like on the XGA screens (the dispersion design is different overall, but this is the difference that causes the patterning). The strips from ICCFL are really good. But I am having some trouble with the pattern on a SXGA+ screen that I did not have like this before. I seems to me, that the beam (or emission?) angle of the LEDs is more narrow than on the other strips I have. I pulled out a strip from ccfloffer from this screen, which was pressed against the waveguide, and had only caused a very minimal pattern. When I mount the strip from ICCFL in the same way, I get very bad mirror images of the LEDs at the bottom. By taping a thin clear plastic strip upright to the front side (not the light emitting top side) of the LED strip it is much better. The LED strip is pressed to the bottom of the bracket and tilted a tiny bit towards the back of the screen. This is almost as good again as with the ccfloffer strip, but I lose 40 nits brightness and the color temperature is slighly warmer with this alignment. Did not notice this on my test SXGA+ because that screen has an additional diffusor sheet inside. And even if I wanted, I could not open the screen I'm working on now, because it used to be a direct-bonding screen where it is not possible to take off the metal frame. Yes, this seems to be a problem with the SXGA+ screens and this strip. I decided to just live with it, since in most use cases (task bar etc) it seems to get sufficiently absorbed. flyingfishfinger wrote: Yes, this seems to be a problem with the SXGA+ screens and this strip. I decided to just live with it, since in most use cases (task bar etc) it seems to get sufficiently absorbed. Not just with the SXGA+. I put one of these strips into my T500 yesterday and had to glue the strip to the bottom of the bracket to avoid the pattern. That worked very well. This the SXGA+ today: http://imgur.com/fpAczhW pic warning! Picture taken from the least flattering angle, with middle gray background also the least flattering. If you ever photographed a screen with the LED pattern at the bottom, you will know it looks much worse in the picture than in real life. The LED on the far right is little too visible. I somehow messed up the position of the strip when bending the cables while stuffing the screen into the lid. Did not want to take it out again when I saw that. Taking apart the SXGA+ mods is not fun. One of the 9 LEDs I had to cut off the strip is now the thinklight. Much better than the original - also gave it a light tilt to right to better illuminate the entire keyboard. Replaced RA amd R3 with 120k resistors in my T500. This works better for me. Especially as Microsoft had to mess up the Fn key brightness steps. Your driver boards arrived last week. I very much like what you did with the brightness steps. The range is also incredible. Also noticed that the BoeHydis HV121P01-101 can give very different results. Using identical parts for the LED mod, I have one that has 220 nits max brightness, and another that has 265 nits. The brighter one also has visible mirror images of the LEDs at the bottom, no matter how I position the strip. Which is not so nice. wileE wrote: Also noticed that the BoeHydis HV121P01-101 can give very different results. Using identical parts for the LED mod, I have one that has 220 nits max brightness, and another that has 265 nits. That's all about the waveguide and films. I've bought several -101 that didn't have an original BOE Hydis waveguide/film set and the difference in brightness was fairly large. Are these both certain-known-original screens? As far as I know the -100 and -101 both used exactly the same internals through the entirety of their runs, but that doesn't mean I know that much. xiphmont wrote: Are these both certain-known-original screens? As far as I know, yes. Both were screens with bubbles where I removed the glass. It's unlikely anyone messed with the insides of those screens. That sounds definitive to me. Awwwwesome, a new piece to the puzzle. waveguide w/built-in horizontal prism/diffuser, single vertical prism sheet, weak top diffuser. an XGA frame to fit them. sides; can add new anchors to right without consequences. Can you take any macro shots of the internal waveguide and films? No way. I'm not going to take those screens apart. My curiosity has limits. But your notes look familiar. I had most of those screens apart when I started with LED mods 3 years ago. You should also note if the back of the panel has a mirror surface. One the reasons for the problems with the SXGA+. wileE wrote: But your notes look familiar. I had most of those screens apart when I started with LED mods 3 years ago. You mean the back of the glass panel? AFAIK, they all do. It's the rear polarizer film. The screen won't work without it. It reflects unaligned light back into the panel to be recycled so it looks partly mirrored. If it was an absorbing rather than recycling polarizer, the screen would be about half as bright. Or are you talking about something different? One reason I asked about internals is that I noticed flipping the waveguide 'upside down' in a -100/-101 causes a small decrease in brightness but appears to markedly reduce the led reflections in the bottom. Perhaps some got made that way on purpose by accident? It has almost no visually noticeable effect with a CCFL in the panel. xiphmont wrote: You mean the back of the glass panel? Yes, I mean the back of the glass panel. The Samsung LTN121XJ-L07 does not have mirror back. A Toshiba TN I took part also was like the Samsung. When the screen is turned on it becomes black, until something is diplayed on the screen. The BoeHydis AFFS work the other way. Mirror surface on the back, screen is really completely black when powered off. When the screen is turned on, those parts that display something become more transparent. Added two pics from 2012. One with the Samsung and BoeHydis SXGA+ side by side. Only the front panel glass. One with a 100W light bulb behind the BoeHydis. I believe this build difference is why the contrast values of TN and AFFS screens from that time were so far apart. wileE wrote: Yes, I mean the back of the glass panel. The Samsung LTN121XJ-L07 does not have mirror back. A Toshiba TN I took part also was like the Samsung. I have always assumed, without a great deal of basis, that IBM and Lenovo generally believed that if you weren't willing to spring for FlexView, screen quality wasn't important to you, so they were going to save as much money on the screen as they possibly could. The TN screens in Thinkpads were uniformly awful, worst/cheapest panels you could get. All speculation! I don't have any idea, just an uniformed opinion. These days, there are still some really bad TN screens, but some of the wide-gamut TNs are not half bad. xiphmont wrote: One reason I asked about internals is that I noticed flipping the waveguide 'upside down' in a -100/-101 causes a small decrease in brightness but appears to markedly reduce the led reflections in the bottom. Perhaps some got made that way on purpose by accident? It has almost no visually noticeable effect with a CCFL in the panel. Tried flipping the waveguide. But I does not look any better this way. The strips from ICCFL certainly cause more problems with patterns and mirrored distortions than the strips that come with the fancyboost kits. Tried both in this screen. wileE wrote: Tried flipping the waveguide. But I does not look any better this way. Flipping the waveguide here didn't eliminate the pattern, but it did smooth out the edges so the overlapped areas didn't ripple as much. That's convinced me to reconsider an earlier suggestion of packing the LEDs as close together as possible. I was going to try the first attempt at that with some custom strip PCBs in the next few days. Maybe there's no one solution, but a few things together can manage the problem successfully. I also ordered some custom LEDs from Nichia that I'm dying to try out. For future reference, Nichia was more than happy to make and sell LEDs for any color bin listed in their references.